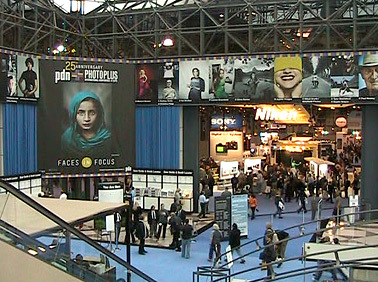 PhotoPlus Expo is back in New York for its 25th year at the Javits Convention Center, with three days of seminars and exhibits. It runs from Thursday, October 22, through Saturday, October 24. This is the biggest photography trade show and conference in the U.S., with some 27,000 attendees, 300 exhibitors, 100 seminars, plus other special events. PhotoPlus is a great opportunity to check out new cameras and accessories from the major manufacturers, including Canon, Kodak, Leica, Nikon, Olympus, and Sony. You can get hands-on time with the equipment and talk details with the staff. The Special Events and Keynotes feature presentations by world-renowned photographers. Plus there's a PhotoPlus Expo Bash party on Thursday night (separate admission). The three days of Seminars (separate registration) cover the art, technology, and business of photography, with eleven tracks including lighting, marketing, Photoshop and color management, portraits / wedding, commercial / editorial, and business management. See also my list of Digital Media Conferences in 2009, including regional events around New York City. This entry posted on October 21, 2009. Previous: Noise-Reduction Bluetooth Headsets: Wrap-up. Next: Joby Gorillapod Flexible Tripods and New Gorillatorch.